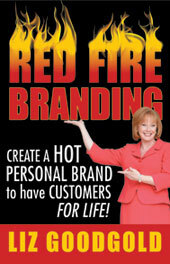 'Red Fire Branding' offers techniques to make your brand sizzle and you a success. so that customers choose you! Hardcover and eBook Shipping Now! Chapter 12. The Head Whip Effect: How to Create a Network and Infomercial Bonfire! For book art, author pictures, or affiliate links, visit the Affiliate Resource page. Creating a hot personal brand so that customers choose you! How do you create a hot personal brand and have customers for life? What is the key to make your brand synonymous with success? 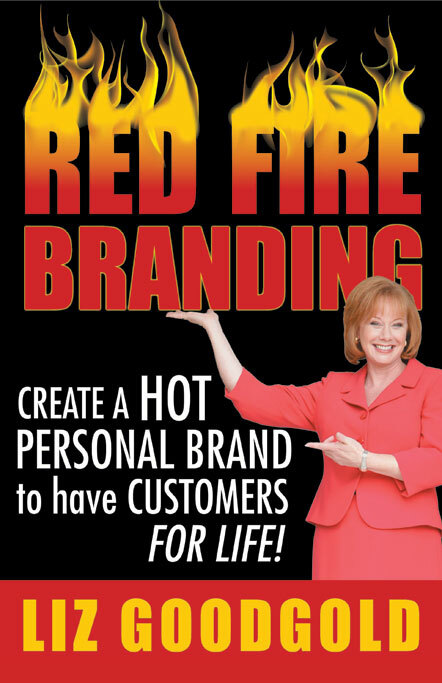 'Red Fire Branding' focuses on how to implement branding techniques to make your brand sizzle and your name unforgettable. In 'Red Fire Branding,' Liz Goodgold directs her works towards the business-to-business market to help small business owners, entrepreneurs, sales professionals, or anyone who is looking to create an indelible image. She offers quick and easy techniques that business owners can learn today and implement tomorrow by presenting readers with immediate, actionable solutions coupled with in-the-trenches insights delivered in a concise and cut-to-the-chase format. This book will spark new ideas that will drive sure-fire results. Learn the super hot secrets and blistering business concepts that have brought success to athletes, authors, consultants, newsmakers and even chefs! Discover how other entrepreneurs and executives have managed to add spice and interest to their brand while winning and keeping new customers and clients. Buy this book today. Read praise on the Bobbin's Blog. Read the latest book review for Red Fire Branding. Liz Goodgold is a marketing and branding expert, speaker, and author, with more than 25 years of experience working for such major companies as Quaker Oats, Times Mirror, and Arco Oil. Currently she is Chief Nuancer and CEO of The Nuancing Group, an identity-consulting firm that helps companies understand the nuances of naming and branding. She also works with a myriad of corporate clients and entrepreneurs for whom she has developed compelling product names, taglines, brand identities, and Internet domains that have generated flawless recall and increased market share. We have a 100% satisfaction guarantee. If you're not satisfied with the book you receive, please let us know within 60 days of purchase and we'll refund your money.